In assessing the capabilities of warships, the most basic parameter is size, usually given in tons. Unfortunately, pre-modern usage was inconsistent and modern authors all too frequently fail to specify which ton they are using and how. The ton has its origins in the English tun, a barrel with a capacity of 252 gallons used in the French wine trade that became the dominant unit of measure for shipping in medieval Britain and western Europe from Amsterdam south. The equivalent in northern waters was the last, roughly two tons, while the botte, about half a ton, prevailed In the Mediterranean. Capacity was at first given in terms of the number of tuns, lasts or botte that could actually be loaded into a ship’s hold. Later, methods were developed for using hull dimensions to calculate precisely capacities in these units (and their local variants, of which there were many). The results were – and are – economically informative. The sizes of sailing warships were calculated in the same way, but the results are less helpful, for carrying capacity is a poor indicator of military potential. By contrast, war galleys were rated according to their number of rowing banks and oarsmen. In both cases, size was related to combat capability; the question is how best to measure and express it. Most modern authors use tonnage – by definition a measure of capacity – to express the size of medieval and early modern ships, but this can be misleading even when used correctly. The modern solution is to rate warships in terms of the weight of water they displace, expressed for convenience in long tons of 2,240 pounds avoirdupois. Unlike medieval capacity calculations, the results are not exact, for a vessel’s displacement varies with the load it carries. The results are, however, meaningful and apply to war galleys as well as sailing warships. 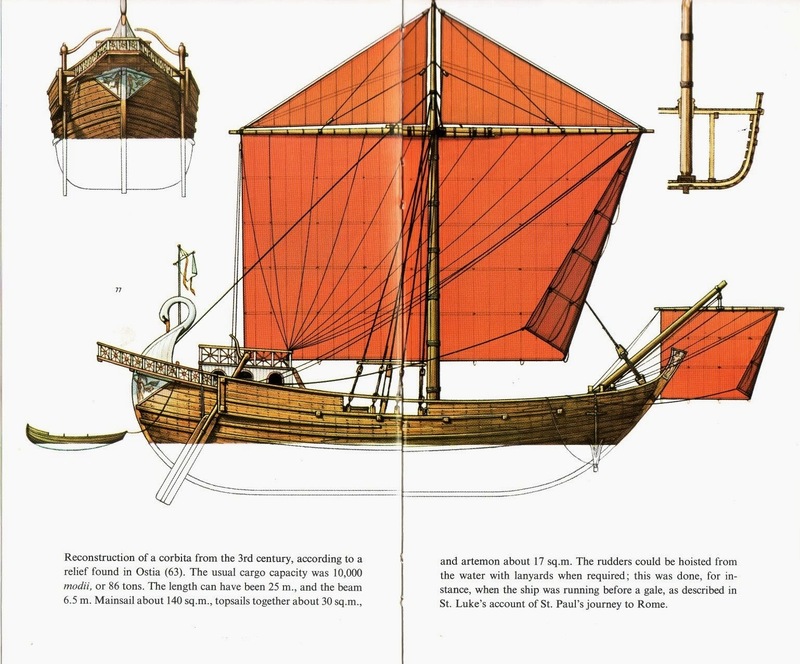 We must obtain them ourselves, however, for in medieval times only Chinese shipwrights were able to calculate displacements, and their methods were lost with the Ming dynasty’s ban on ocean-going vessels. European shipwrights began calculating displacements only in the late 1600s, and for another two centuries used the results only as part of the design process. 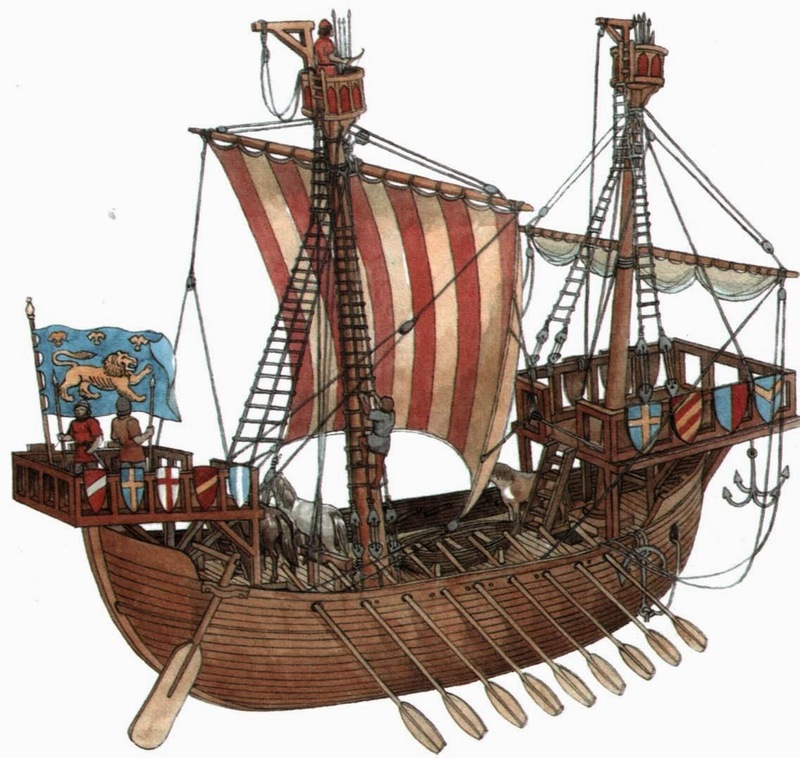 Fortunately, medieval and early modern shipwrights – at least successful ones – were systematic and their designs consistent. Knowing the dimensions of a few representatives of a given type, we can calculate the displacements of the rest with reasonable accuracy from one or two parameters: length, breadth and depth of hull or capacity in tons, lasts or botte. We are helped in this endeavour by naval historian Jan Glete who has calculated the displacements of an immense number of early modern warships and published the results in his trail-breaking Navies and Nations: Warships, Navies and State Building in Europe and America, 1500-1860. Trying to play off the various nationalities against one another, the Metternich regime, for instance, would use officials of Czech origin as tools of Germanization in Polish Galicia, and would welcome the growing antagonism between the Magyars and the other groups in Hungary. 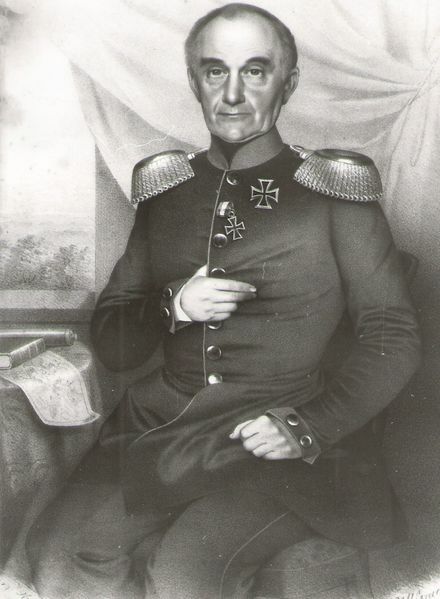 In that kingdom, whose state rights even Metternich could not completely disregard, Hungarian nationalism was making rapid progress, particularly in the cultural and economic field, thanks chiefly to Count Széchenyi, called “the greatest Hungarian,” who in 1825 founded the Hungarian Academy of Sciences. The Diet, which continued to function though with greatly reduced power, was slow to carry out the democratic reforms advocated by Széchenyi, but in its session of 1843 – 1844 it at last decided to replace Latin by Magyar as the official language. 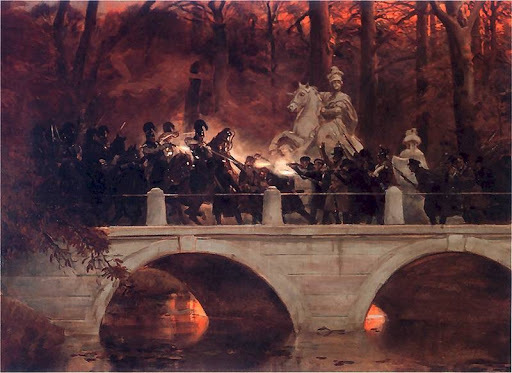 Clash between Polish insurgents and Russian cuirassiers on bridge in Warsaw’s Łazienki Park. In background, an equestrian statue of King John III Sobieski. Painting byWojciech Kossak, 1898. This 1836 map of Eastern Europe shows Poland. 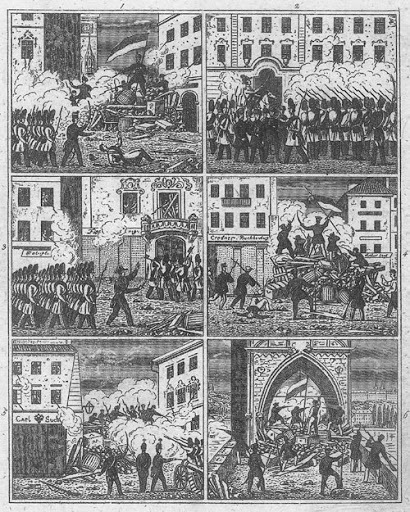 The Polish insurrection which broke out in Warsaw on November 29, 1830, is sometimes called a Polish-Russian war. It was indeed a conflict between the kingdom of Poland, which was supposed to exist again after the Congress of Vienna, and the Russian Empire, to which that separated body politic was attached by a personal union only. 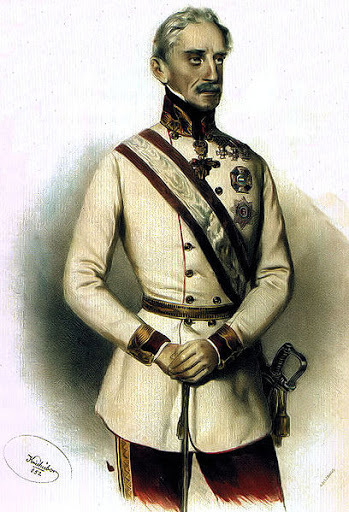 But long before the Polish army rebelled against the czar’s brother, Grand Duke Constantine, who had been made its commander in chief, and before the Polish Diet on January 25, 1831, formally dethroned the Romanov dynasty, the whole conception of 1815 proved a fiction which could not possibly endure. During the fifteen years between the Congress and the Revolution, no little progress had been made in the kingdom, particularly in the cultural and economic fields. A Polish university was opened in Warsaw in 1817, and the most prominent member of the Polish government, Prince Xavier Lubecki, achieved a great deal as minister of finance. But already under Czar Alexander, solemnly crowned in Warsaw as king of Poland, even those Poles who had accepted the Vienna decisions as a basis for constructive activities were deeply disappointed. Alexander’s vague promises that the eastern provinces of the former commonwealth would be reunited with the kingdom proved impossible of fulfilment, even if they were sincere. Although under Russian rule Polish culture continued to flourish there, particularly in the former grand duchy of Lithuania where the University of Wilno was a more brilliant center of Polish learning and literature than ever before, the Russians considered those “West-Russian” lands an integral part of the empire which the czar had no right to alienate. Already in 1823 Prince Adam Czartoryski was removed from his position as “curator” of the University of Wilno, where severe repressions against the Polish youth organizations started at once. The Russian senator N. N. Novosiltsov, chiefly responsible for these measures, was at the same time interfering with the administration of the kingdom where instead of Czartoryski the insignificant General Zajaczek was appointed viceroy. Novosiltsov’s role was of course contrary to the apparently liberal constitution which Czartoryski had helped to draft. The leading patriots in the Diet tried in vain to defend Poland’s constitutional rights on legal grounds, while those who realized the futility of such loyal opposition engaged in conspiracies which even the most severe police control proved unable to check. The tension rapidly increased when Alexander I died in 1825. After the abortive December revolution in St. Petersburg, whose leaders seemed to favor the Polish claims, he was succeeded by his brother Nicholas I. He too was crowned as king of Poland a few years later. But without even the appearance of liberalism which had been shown by Alexander, he considered the parliamentary regime of the kingdom as being completely incompatible with the autocratic form of government which he so fully developed in Russia. Hence the Polish radicals, under the leadership of young infantry cadets, rose in defense of their constitution. Public opinion was alarmed by the news that the Polish army would be used by the czar as a vanguard for crushing the revolutionary movements which in 1830 had broken out in France and Belgium and which received Polish sympathy. Even the moderate leaders who were surprised by the plot of the cadets and who considered the insurrection as having been insufficiently prepared, joined it in a spirit of national unity, though much time was lost through the hesitation of those who still hoped to appease the czar and to arrive at some compromise. Among these was General Chlopicki, who was entrusted with practically dictatorial powers. Even later, the changing leadership of the Polish army, which for nine months opposed the overwhelming Russian forces, proved rather undecided and inadequate so that even initial successes and bold strategic conceptions of the general staff were not sufficiently utilized. Therefore the struggle ended in a victory of the Russian Field Marshal Paskevich, a veteran of the war against Turkey, and on September 7, 1831, after a siege of three weeks, Warsaw was taken by storm. Two aspects of that greatest Polish insurrection of the nineteenth century are of general interest, one with regard to the problem of nationalities in East Central Europe, the other from the point of view of international relations in Europe as a whole. The uprising which had started in Warsaw as an action of the so-called “Congress Kingdom,” had immediate repercussions east of the Bug River, in the Lithuanian and Ruthenian provinces of the historic commonwealth. Particularly in the former grand duchy of Lithuania there was a strong participation in the revolutionary movement against Russian rule, not only among the Polonized nobility but also among the gentry and the peasants of purely Lithuanian stock. And though there were social controversies in connection with the promised abolition of serfdom, there was no Lithuanian separatism on ethnic grounds but a common desire to restore the traditional Polish-Lithuanian Union in full independence from Russia. Regular Polish forces came from the territory of the kingdom, and the movement spread as far as the Livonian border but was unable to liberate the main cities and broke down with the doom of the insurrection in Poland proper. The leaders of the revolution also hoped to obtain the support of the Ukrainian lands. Here, too, they appealed not only to the Polish and Polonized nobles and to the idea of Polish-Lithuanian-Ruthenian cooperation in some tripartite federation of the future, but also to the peasant masses which, however, remained distrustful and passive. The young Taras Shevchenko, who was soon to become the first great Ukrainian poet, had contacts with some of the Polish leaders. But he was not won over, and later he made the significant statement that “Poland fell and crushed us too.” For the czarist government, after the defeat of the Poles, started a ruthless Russification not only in the Congress kingdom but also in all Lithuanian and Ruthenian lands where not only the Poles and the supporters of the Polish cause, but all non-Russian elements, were also the victims—a situation which greatly contributed to the rise of Lithuanian and Ukrainian nationalism. While these indirect consequences of the November insurrection appeared only later, the diplomatic repercussions in general European politics were simultaneous. All Poles realized that their fight for freedom could have notable chances for success only if supported by other powers. Therefore, turning exclusively against Russia, which controlled by far the largest part of Poland’s historic territory in one form or another, they hoped for the complacence of Austria and even for some sympathy among the liberals in Germany. Decisive, however, seemed the attitude of the Western powers, France and Britain. Well realized by Polish public opinion in general, the necessity to find outside assistance was the main concern of Prince Adam Czartoryski, Poland’s greatest statesman of the nineteenth century. After years of endeavor toward a reconciliation with Russia he now recognized the hopelessness of such a policy and for the remaining thirty years of his life was to be Russia’s most persistent opponent. Although Czartoryski never was popular among the leftists led by the famous historian Joachim Lelewel, his authority was so great that he was placed at the head of the national government. As such he made every effort to make the revolution an international issue, and he sent diplomatic representatives abroad, particularly to Paris and London. After the dethronement of Nicholas I as king of Poland, even the election of another king was considered. In order to interest Vienna in the Polish cause, the candidature of an Austrian archduke or of the Duke of Reichstadt, Napoleon’s son who was kept at the Austrian court, was put forward, as well as that of the Prince of Orange or of a member of the British royal family. More realistic was the conviction that all signatories of the 1815 treaties ought to be interested in the violation of the promises then made to the Poles, and that they would therefore intercede in their behalf. But all the diplomatic skill of Czartoryski and his collaborators proved to be of no avail. Even statesmen who seemed favorable to the Poles, such as Talleyrand and Sebastiani in France or Palmerston in England, wanted them first to gain substantial victories through their own forces. Prospects of a joint French-British mediation, with the possible participation of Austria, vanished when the Belgian problem created a tension between the two western powers, while Austria showed some interest in Poland’s fate only at the last moment when the defeated Polish regiments had already crossed over into Galicia, only to be disarmed there like those who crossed the Prussian border. As a matter of fact the Polish insurrection had saved France and Belgium from Russian intervention, thus giving evidence that a really independent Poland would be a protection against czarist imperialism, as in the past. Therefore Czartoryski, who after participating as a volunteer in the last fights went into exile for the rest of his life, hoped that the complete conquest of Congress Poland by Russia would again raise those fears of Russian expansion which were so general in 1815 in Vienna. In Paris he tried to convince old Talleyrand that at least a restoration of the autonomous kingdom ought to be requested from the czar, but Sebastiani made the famous statement that “order reigned in Warsaw,” and in London, where the prince made many friends for Poland, he heard the objection that “unfortunately the Polish question was contrary to the interests of all other powers. To convince the world that this was not so was Czartoryski’s main objective after his final establishment at the Hotel Lambert in Paris from 1833 on. He tried to accomplish his ends by connecting the Polish cause with that of all oppressed nations. Therefore that “uncrowned king of Poland,” with his diplomatic agents in almost all European capitals, was working for the liberation of the whole of East Central Europe. In the belief that the fate of Poland was part of a much larger problem, the whole Polish emigration, concentrated in France and inspired by great poets including Adam Mickiewicz, was united in spite of differences of method between the right and the left. The latter, eager to join revolutionary movements anywhere, was also eager to organize new conspiracies in the oppressed country at once, with another insurrection as ultimate goal, without sufficiently realizing that there was not the slightest chance of success under the regime established by the victorious czar in all his Polish possessions. In addition to the ruthless persecution of everything that was Polish or connected with Poland in the eastern provinces where the University of Wilno and the Uniate church were the main victims, a period of reaction also started in the so-called kingdom under Paskevich as general governor. 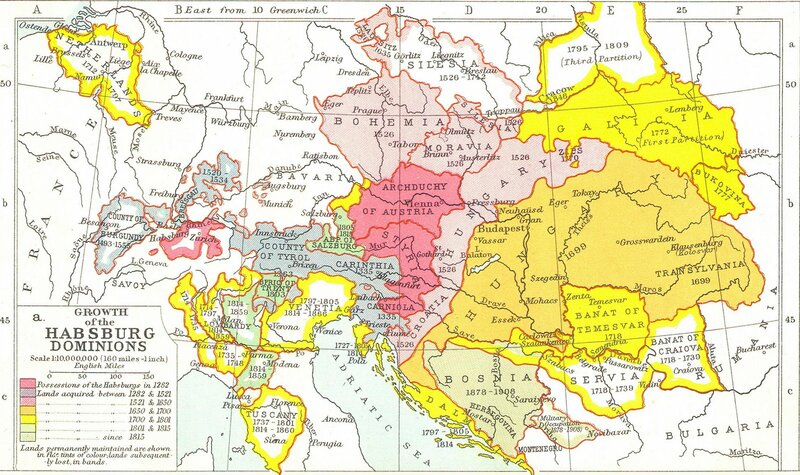 Considering that the Poles through their rebellion had forfeited all rights granted them at the Congress of Vienna, in 1832 Nicholas I replaced the constitution of the kingdom by an “Organic Statute” which liquidated its autonomy and made it practically a Russian province, subject to systematic Russification particularly in the educational field. The fiction of a restoration of Poland in union with Russia was now abandoned and the czarist empire advanced to the very boundaries of Prussian and Austrian Poland. Under these circumstances the other two partitioning powers became convinced that close cooperation with Russia was indispensable. A secret agreement was therefore concluded in 1833 by the three monarchs, who guaranteed one another their Polish possessions and promised mutual assistance in case of a new revolution. 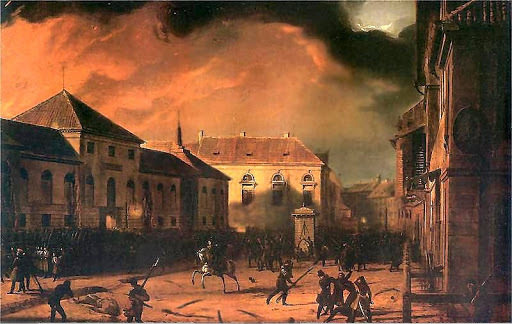 Jointly, they also militarily occupied (without however annexing it) the Free City of Cracow where the November insurrection had found numerous partisans. The settlement made at the Congress of Vienna was thus revised in East Central Europe in favor of the imperialistic powers, and it became even more intolerable for the submerged nationalities. For the reaction directed against the Poles, whom Metternich considered the typical revolutionaries, was accompanied, both in the Habsburg Empire which he fully controlled and in the Russia of his ally Nicholas I, by oppressive measures against all other peoples who were dissatisfied with their fate.